My family and I were thrilled when we discovered this book about a Zen Buddhist giant panda named Stillwater and his friendship with the neighboring children Addy, Michael, and Karl. It’s rare to find a children’s book focused on Zen much less a Zen panda bear! Stillwater is the quintessential Zen teacher (speaking “with a slight panda accent”), casually giving out three short and relevant meditations in the form of parables. Addy, Michael, and Karl seem so accepting of the panda Zen teacher who suddenly shows up outside their home and the lessons he imparts from each parable. It took me a few readings before I could grasp the depth of meaning behind each of the stories and fully appreciate the author’s brilliance in storytelling (-and I’m still trying to accept the Zen panda!) Children, of course, seem to be naturals in Zen practices since they so easily are focused on the present moment while adults struggle to keep from obsessing over past mistakes or glories, future worries and bills, and what’s realistic or not. These short meditations offer a wealth of wisdom and practical application for not only children, but adults as well. 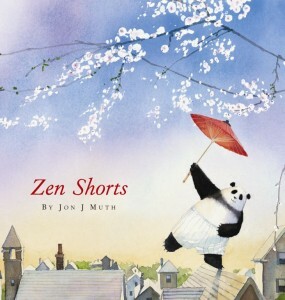 And how “Zen” of Jon J. Muth to tell stories within a story! The three stories Stillwater introduces are centuries-old Buddhist stories (one may even be from Taoist teachings from thousands of years ago!) and lessons with modern day applications. The first is a tale about a poor man and a robber and how materialism can blind you to the riches and beauty in life. The second story offers a look at perspective when judging an event as good or bad because you never know what can happen in the future that may change the way an event is viewed. The last story reflects upon anger and how easy it is to keep carrying it and letting it overshadow anything positive. Stillwater’s telling is eloquent and rich in metaphor and meaning. Muth adds a page at the end of the book, giving background on Zen terms and historical references. 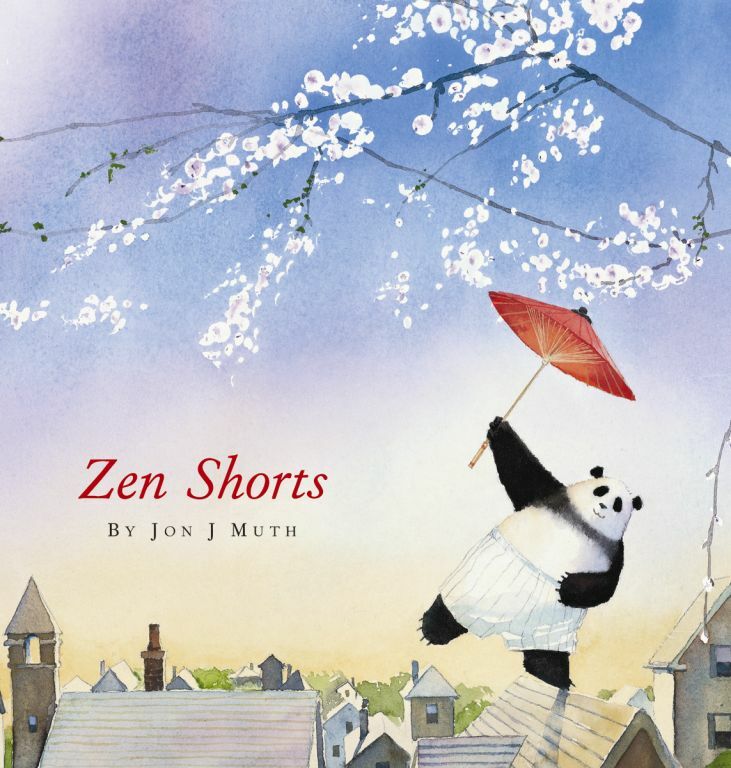 Muth creates a wonderfully witty and clever way to share life lessons through the Buddhist dharma (teachings) with children. Luckily, adults can learn right alongside and from their kids. The watercolor illustrations are detailed, appealing, and delicate with a shift to the simpler black and white reminiscent of Asian brushwork for the short stories. I adore the humor that Muth injects in the stories and art, like Stillwater wearing his shorts to represent the Zen “shorts” (stories) in the book. You can’t help but smile at a Zen practitioner panda bear wearing shorts! It is no surprise that this story is a Caldecott Honor Book.